Alrighty! It’s tomorrow. Time to start something new! Step 2 is to get to my Weight Watchers Meeting and get on that scale. Hold on, Wait a minute. Then what’s Step 1? Well — Step 1 was to wake up, committed not to give a C.R.A.P what the scale said. Not even a little bit. 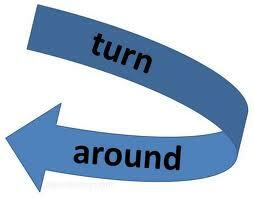 Cuz a turn around has got to begin…..where-ever you are right now. It’s the only starting place there is. So, Step 1 done! Out the door to the meeting. All morning, I was yawning like crazy. Fatigue has overtaken my body, and no amount of coffee — neither Keurig nor Starbucks Blonde Roast — was going to make up the difference. Some wonderful time with a friend reflecting on past choices (both the good and not so good varieties) was just what the doctor ordered. Here’s something that made me feel better. Scanning the www…I learned that some hold the belief that a newly-minted marathon runner should take 1 rest day for every mile ran. So….Starting Jan 14th, 2013 – I should have been setting myself up for at least 26.2 days of rest. Yea, um — I gave myself 5. 5 rest days. The first Saturday after the marathon, I was out running 2 miles. And then on a Half Marathon schedule from there. D.I.A.N.E — That was RIDICULOUS! Such a bad idea. But….what did i know?? Not much. I had no idea just how tired I would be, mentally, but I was about to learn. The hard way. So , with 5 days of rest in my bank, I started running 4-5 days a week. No long distances, but still more than I was able to keep up with. Then, I began to slip. Skipping a day here, two there. Until my mind and body stages a coup d’etat and just bailed on me all together. No more running. Nah. Nah-Gonna-Dah-It! That was two weeks ago. I just stopped. Diane was demanding the BREAK — a month late — but sooo demanding, none the less! The problem with the kinda BREAK I took was — that I took a break from EVERYTHING. From running, and eating well, and tracking, and drinking water, and healthy choices, and meditation. All Of It. Out the window. It was like I went on a Couch Potato Vacation. And I just arrived back home today with 15 pounds of souvenirs on my hips, tummy and thighs! Aye – aye -aye! And….today, the break is over. But instead of demanding that I resume right where I left off — at the peak of “my” game — I’m allowing myself to start over. From a new beginning. There is just Today. And besides….Today is the best day. Today is The Present! Hahaha! So, today I began with a solid powerful breakfast. An egg over easy, with chicken, broccoli and rice sautéed in olive oil on the side. A cup of coffee. And some orange slices. 7 PPVs in total. Then I moved on to do 20 minutes of meditation. A.w.e.s.o.m.e!! Then I began my water drinking. And Saturday errands. Lunch from Whole Foods — Pecan Wasabi Salmon with roasted butternut squash on the side, with watermelon as a dessert. 8 PPVs in total. It’s about 330pm as I sit journaling with you, as snow falls like a little March blizzard outside. And I feel better. MUCH better. I feel contented. Satisfied. Like I’m beginning to fill the gap inside that will never be filled by food. it’s time to get back to figuring out what that little missing piece inside Is, and what she needs. I’m certain chips and candy bars are NOT it. Trust me — I’ve done the research. That experiment was completed! No more work needed there. Fo’ real! It’s great to “wake up” again. Awakened Marathon Diane, the lady who can do anything. I wonder where her next chapter will take her.